Africa Travel Association salutes Olive Branch Tours and the key part its President, Mr. Benachir Akli has played in helping ATA develop of a professional presence in the Kingdom of Morocco. The partnership, which began at an ASTA Conference, led to the association's highly successful ATA Ecotourism Symposium at the Hotel Mansour Eddahbi in Marrakech in 1996. Six years later Olive Branch Tours was active in laying the foundation for ATA's 6th Cultural and Ecotourism Symposium in the Imperial City of Fès. During Africa Travel Magazine's next visit to Casablanca, we had the opportunity of spending several days working from the company's office in the heart of Casablanca . Almost immediately we were impressed by the courtesy of loyalty of Mr. Alki's staff memberst, many with long time service records..
Morocco's future as a travel destination has neverlooked brighter. New hotels in Fez, Marrakech and Agadir stand readyto welcome visitors as the hospitality industry constantly strives toupdate its infrastructure. 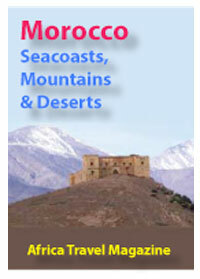 Moroccan roads, railway and airlinesystems also provide excellent means of travelling within thecountry. In other words, there has never been a better time toencourage your clients to visit! Morocco's temperate Mediterranean climate, itsextraordinarily varied landscape and exoticism blended with all thelatest Western amenities, and most of all its proximity to majorEuropean gateways and even to the United States (New York is only sixhours flying time away) place it high on the list of excitingdestinations. We invite you to go on trek into the Atlas Mountains and " break bread " with local inhabitants, take a short camel safari into the sahara, ski down the slopes of one of highest mountains in Africa and swim in the Atlantic the very same day, explore wonderfully preserved Roman ruins, immerse yourself in the centuries-old Moroccan civilization, and savor superb local cuisine. If relaxation is what you're after, then spend some time by the pool of one of Morocco's beautiful hotels and let yourself be pampered by an attentive staff. Either way, we'll be happy to plan your visit .